WE BUILD FROM EVENT TO EVENT! - Lead with the money first. Show prospects how to PAY their bills AND TRAVEL! - It's time to Breakout to BREAKTHROUGH! - What did you like best about what you saw? - What would you like to have happen next? - What is your timeline? Annual White Party, and More! Full Day Travel Expo, YTBTN CEO Shelly Coppersmith, and More! Wow! Coach Visits with FIVE New Pre-Qualified Marketing Directors! Kelly Jenerett, Adrienne Dawkins, Rick & Brenda Reese! New Contest! Top 5 in Team Builder WIN! Join us in the DR! Surge365 Vortex Platinum ~ Limited Time Special Pricing! Don't Miss it! 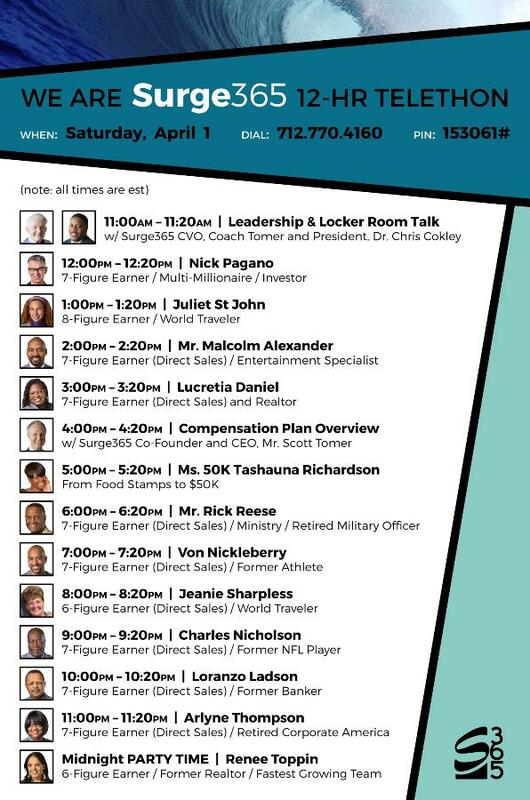 Study and Practice...walk family and friends through the roadmap...Provides a great overview and pathway forward to grow your Surge365 business. What do they want? What's the need? Travel More, Save More, Make More... What's their time commitment: Part Time, Full Time, or BIG TIME!